Could you be deficient in these two essential nutrients and not even know it? For those of you who have been diligently exploring the best nutrient strategies for your thyroid health, your research has likely brought you to things like iodine, selenium, tyrosine, and zinc. Iodine tops the list as one of the most important nutrients for the thyroid, as do the others, but there are two other nutrients that are not that often properly lauded with the accolades they deserve. 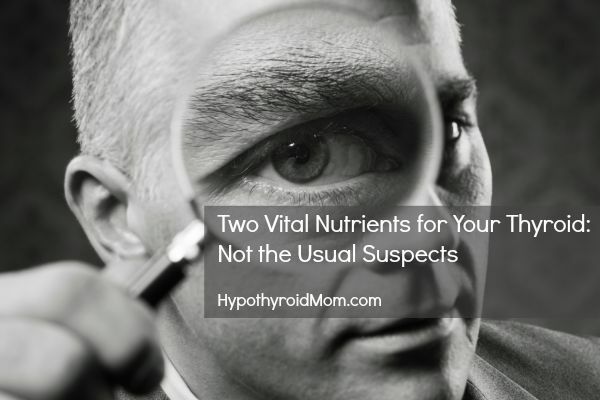 These nutrients are also massively misunderstood in respect to their role in health and thyroid function but also highly misdiagnosed as being deficient in the first place. But misunderstood and misdiagnosed are two phenomena that spark me to dig deeper, which is why I am a thyroid disease advocate and why I am going to shed some much needed light on these nutrients for you right now. Now this really isn’t earth-shattering (or thyroid-shattering) news for some of you, but magnesium isn’t always at the top of the list for thyroid health. It’s often viewed as an after-thought and if it is prescribed, then the dose is often more of a maintenance dose that does not really improve body magnesium stores. Let’s dig into this now and see how magnesium not only helps your thyroid, but countless other mechanisms in your body. Magnesium is responsible for converting the inactive T4 thyroid hormone into the active form of T3. This is extremely important because the metabolism of your body cells are enhanced by T3, not inactive T4. Magnesium deficiency is related to goiter, or an enlarged thyroid gland. Another important nutrient in preventing goiter is iodine, but magnesium is right there helping too. Magnesium helps you to make more T4 in the thyroid gland. Without magnesium, many of the thyroid enzymes that make thyroid hormone simply could not function. Where is all the Magnesium? We live in a calcium dominant and magnesium deficient society. Simply, we ingest many foods that have plenty of calcium but not a lot of magnesium. We tend to hear more about the importance of calcium supplementation than we ever do about magnesium supplementation, although that is starting to change. High amounts of calcium not only compete with your magnesium stores in your body, the excess intake of calcium has been associated with kidney stones and atherosclerosis. [ii] [iii] One of the reasons we are seeing the excess accumulation of calcium deposits is that we are not properly absorbing calcium due to being deficient in magnesium and even vitamin K2. Where Do I Get Magnesium? How Much Do I Need? Be sure to focus on magnesium-rich foods which include almonds, pumpkin seeds, chard, spinach, avocado, figs, and even dark chocolate. Unfortunately, the quality of most foods, even organic, do not contain consistently adequate amounts of minerals including magnesium. So supplementation is key to getting your magnesium stores up for your thyroid health. For supplementation for your thyroid and general health, I suggest two different categories of magnesium, depending on whether you have constipation or not. If you have constipation, then I recommend Magnesium Citrate at a dose of 400 mg to 1000 mg to relieve the constipation and start to increase magnesium stores. I’ve included links to high quality brands. If you do not have constipation, but many of the other symptoms, then I recommend Magnesium Glycinate at a daily dose of 400 mg to 800 mg. This helps you to increase magnesium stores and will not increase bowel motility for those that do not really need it. Do those symptoms sound familiar to you? For many here at Hypothyroid Mom, they may be extremely familiar. It may be that many of you read that list of magnesium deficiency related signs and symptoms and discover that you have always thought it was related to your existing or suspected low thyroid condition. That still may be true. But it is also very important to note that the symptoms could be from a magnesium deficiency directly and/or hypothyroidism (low thyroid) from the magnesium deficiency. Either way, magnesium can help you and your thyroid. Here is the second nutrient that is not only deficient in most patients with low thyroid, but is often avoided because of a huge misconception about what it is and how it can help you. Along with the other important fat-soluble vitamins, D, E, and K, Vitamin A acts on the cells of the body like a hormone because it directly affects the DNA of the cell nucleus directing cellular protein production. It’s a fancy vitamin and has many important functions in your body including reproduction, eye function and vision, skin health, immune enhancement, and cellular growth. Vitamin A has been found to decrease autoimmune reactions in the body and therefore lessens the risk for thyroid autoimmune disease like Hashimoto’s thyroiditis. [vi] Hashimoto’s thyroiditis is a very common reason why patients have low thyroid and it can complicate the treatment outcomes if you are not working with a doctor who understands the condition. How Do I Know If I Am Deficient in Vitamin A? Sound familiar? Every one of these conditions or symptoms can be related to low thyroid (hypothyroidism). The thyroid is known as the “great pretender” because it either mimics other disease processes or is associated with them directly. Vitamin A can help either directly or indirectly with your thyroid and the related symptoms you are suffering with. Where Should I Get Vitamin A? This leads me to my next point about the best source for real Vitamin A and that is animal sources. Vegetables simply cannot keep up with Vitamin A demands because they need to be converted by the body. The best sources of real Vitamin A retinol are animal sources such as liver, particularly fermented cod liver oil , raw dairy, and cultured butter. A great brand for cultured butter is Organic Valley which can be found at Whole Foods. Raw milk is sometimes challenging to find, depending on the region. It is very important to explore the Weston A. Price Foundation and their Real Milk Finder. In Arizona, I get my raw milk from Healthy Habits Food Stores in Phoenix, where they obtain it from a local dairy. It’s delicious and I highly recommend it! These sources have a low likelihood of toxicity due to the presence and balance of the other fat-soluble vitamins D, E, and K. It is very important to balance real Vitamin A retinol with adequate amounts of these vitamins, particularly Vitamin D.
The landscape out there for those suffering with thyroid problems is a vast and rocky desert at times, but filled with the occasional oasis of wisdom. I hope this article stands as an oasis of simple wisdom for you and a reminder that there are answers for you, there are advocates for you, and there are doctors who will listen. Keep exploring and realize the answers are sometimes very elegantly easy. Dr. John A. Robinson is a Board Certified Naturopathic Medical Doctor in Scottsdale, Arizona and author of the book ThyroZone: Real Thyroid Solutions for Better Health and Better Living . He specializes in natural hormone replacement therapy and thyroid disease. [i] Hsu JM, Root AW, Duckett GE, Smith JC Jr, Yunice AA, Kepford G. The effect of magnesium depletion on thyroid function in rats. J Nutr. 1984 Aug;114(8):1510-7. PubMed PMID: 6747732. [ii] Li K, Kaaks R, Linseisen J, Rohrmann S. Associations of dietary calcium intake and calcium supplementation with myocardial infarction and stroke risk and overall cardiovascular mortality in the Heidelberg cohort of the European Prospective Investigation into Cancer and Nutrition study. Heart. 2012 Jun;98(12):920-5. [iii] Chakraborti S, Chakraborti T, Mandal M, Mandal A, Das S, Ghosh S. Protective role of magnesium in cardiovascular diseases: a review. Mol Cell Biochem. 2002 Sep;238(1-2):163-79. [iv] Farhangi MA, Keshavarz SA, Eshraghian M, Ostadrahimi A, Saboor-Yaraghi AA. The effect of vitamin A supplementation on thyroid function in premenopausal women. J Am Coll Nutr. 2012 Aug;31(4):268-74. PubMed PMID: 23378454. [v] Zimmermann MB. Interactions of vitamin A and iodine deficiencies: effects on the pituitary-thyroid axis. Int J Vitam Nutr Res. 2007 May;77(3):236-40. Review. [vi] Ikeda U, Wakita D, Ohkuri T, Chamoto K, Kitamura H, Iwakura Y, Nishimura T. 1α,25-Dihydroxyvitamin D3 and all-trans retinoic acid synergistically inhibit the differentiation and expansion of Th17 cells. Immunol Lett. 2010 Nov 30;134(1):7-16. doi: 10.1016/j.imlet.2010.07.002. [vii] Hedrén E, Diaz V, Svanberg U. Estimation of carotenoid accessibility from carrots determined by an in vitro digestion method. Eur J Clin Nutr. 2002 May;56(5):425-30. Thank you so much for this blog!!! It has been so helpful in my hypothyroid journey. I was recently diagnosed back in June. I wanted to know if magnesium will interact with my thyroid medication. Do I need to take it several hours after taking my medicine first thing in the morning? I’ve been on thyroid replacement since 1986 when I had my thyroid removed do to what I was told was cancer,but since then wondered if it was merely a lack of iodine do to an avoidance of sodium- concerned about getting high blood pressure which my father was diagnosed with when I was about 9 yrs. old. I’d always been pretty active growing up-or at least tried to be ,I would try to follow in my older brothers footsteps and workout, and even took yo jogging and loved tooling around on my 10 speed cruising to my favorite jams. But I would always find myself overly exhausted and have to take long breaks between activities– days or weeks. It wasn’t until I was 20 that I’d developed a goiter that my other brother had pointed out to me one day as I was coming upstairs from a workout in the basement. My family started freaking out and urged me to go to get it checked out immediately. I hear you Tim about the struggle in finding optimal thyroid treatment. I wish all doctors knew how to help thyroid patients. Here in this article you’ll find a few reasons why people can react poorly to thyroid medications including a T4/T3 combo to help guide you at your next doctor appointment.